It is hard to believe that our water can be anything but wet, so what does it mean to have hard water? Many homeowners take the water that enters into their homes for granted and don’t really think too much about quality, as filtration systems are set up to block contaminants from entering the supply. However, you could be experiencing the effects of hard water, even with the best filtration system in place. So what do you do? A water softener in Orlando, FL is the best solution for hard water. 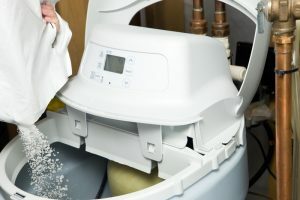 Installing a new water softener can mitigate the negative effects that hard water can have on appliances like dishwashers and washing machines, as well as various pipes and fixtures throughout your home. So, how do you know if you have hard water? Well, keep reading below! We have listed some of the tell-tale signs that your water is just too hard. Posted in Plumbing | Comments Off on Is My Water Too Hard? Do you have hard water in your home? Do you find the taste of your water unpleasant? Or do you think your water is contaminated? Modern Plumbing Industries, Inc. (MPI) has an expert team of water treatment technicians who can handle a variety of water problems. Call an Orlando plumber today to hear more about what we can do to make your water safe and taste better. Water treatment technology filters your home water supply to get rid of unwanted minerals and contaminants. There are a variety of different options available to homeowners today, from reverse osmosis systems to specialty cartridges and more. The first step is to consult with a plumber in Orlando to understand your options and what works best for your budget and your needs. If you get your water from a municipal supply, it is rare for them to contain microorganisms or bacteria—more often than not, such water is high in minerals. To test your tap and to find out what’s in your water, schedule professional water testing with one of our water treatment specialists today. There are two basic systems to water treatment: reverse osmosis and specialty cartridges and housing. Reverse osmosis cleans contaminated water by reversing the natural biophysical process of osmosis, which involves transferring water from one side of a membrane to another. Reverse osmosis creates pressure that forces the contaminated water through such a membrane, and because water is chemically distinct from its contaminants, it is thereby separated. The result is pure water. This process is usually supplemented with other filters to make for an excellent and efficient treatment option. There are a variety of special cartridges and housing options to filter the water in your home. Filtration works by capturing contaminants on a porous textured surface. Carbon is a popular medium that can be very effective. Faucet mounts as well as in-line and line-bypass cartridges and housing are available to the homeowner who wants a variety of different filtration options for his or her home. There are many benefits to water treatment in your Orlando home. Call Modern Plumbing Industries, Inc. (MPI) to schedule a consultation today. Plumbing Question: Why Should You Get a Whole House Water Filter? Most of us have heard about whole house water filters by now. But what exactly are the actual benefits to whole house water filtration systems? We’ve put together a quick list of some of the benefits to having a water filtration system installed in your Orlando home. This should provide some great information for you as you begin to make this decision. A whole house filter differs from other water filters in that it actually filters all the water entering the house—not just the water that you drink. This means that the water you shower in, the water you wash your dishes with and the water you drink are all filtered. A whole house water filter is installed by a professional Orlando plumber in line with the main water supply line coming from either your well or from the city. Water passes through the filter and goes into your home. Mineral build up can be the cause of expensive repairs in home appliances like water heaters, washing machines and dishwashers. A whole house water filter can remove or greatly reduce the amount of minerals that are in your water. This keeps them from building up inside your appliances and causing blockages and clogs. If you have any questions about whether or not a whole house water filter is right for your Orlando home, then call Modern Plumbing Industries, Inc. (MPI). Our plumbers can answer any questions you might have. Posted in Plumbing | Comments Off on Plumbing Question: Why Should You Get a Whole House Water Filter?